IN LATE APRIL, then Minister for Social Protection Leo Varadkar launched a new campaign entitled ‘Welfare Cheats Cheat Us All’ encouraging the reporting of welfare benefit fraud by the public. The campaign has generated a great deal of debate, both from those approving of the sentiment and those harshly critical of the policy. One of the key claims of the initiative (which remains prominently displayed on the Department of Social Protection’s (DSP) website, and was used as a marquee figure in the advertising drive which went along with the campaign) is that €500 million was saved in Ireland last year on foot of members of the public reporting relatives, friends, neighbours, and acquaintances on suspicion of benefit fraud. A subsequent 15 May debate on RTÉ’s Today With Seán O’Rourke between south Dublin Fine Gael councillor Paddy Smyth and former welfare fraud inspector Bernadette Gorman saw Gorman argue that the figure is in fact closer to €41 million. So which side is telling the truth? The Department’s response can be viewed here. The key to the Department’s approach to estimating fraud is a ‘control’ scheme, one that uses a series of multipliers (estimates of how long a fraud would continue to be carried out before being brought to a halt in other words) in its calculations. In simpler terms, the Department assumes that if a fraud isn’t detected, it will continue for a set further period of time, with different time periods applied to each of the 70 welfare schemes DSP operates. These calculations cover both reductions in and termination of payments once fraud has been identified, and are measured in weeks (and in certain cases months). They range in size from 26 weeks for Jobseeker’s Benefit (for both reduction in payment and termination), to 52/136 weeks for Carer’s Allowance and most other benefits, to 12/34 months for Child Benefit. “The methodology underpinning the calculation of the savings was developed by the Department, in conjunction with the CSO and is similar to that used in other countries, such as the UK and Australia,” the DSP said in relation to the system used to estimate welfare fraud. However, that system has been in use since at least 2009 – whether or not it has been adjusted to account for changing social metrics such as rising/falling unemployment is unclear. Recent exercises concluded that savings and/or overpayments have been recorded in about one-third of cases where a report was received from a member of the public. This statement is given a caveat – “note that this work is not designed – nor is it large enough – to allow for statistical inferences to be drawn from the results” – however, for the basis of this FactCheck we will assume this one-third figure is applicable across the board. Let’s take the three largest figures attributed to welfare schemes as samples. These three schemes account for almost two-thirds – €318 million – of all welfare fraud savings made last year, according to DSP. In each sample, we’ll be looking at how many allegations of each type of fraud there were last year, how many were likely to have resulted in actual fraud, and the total savings this would have amounted to. These calculations have been arrived at with the assistance of Professor Micheál Collins of the UCD School of Social Policy. Jobseeker’s welfare benefits form almost 40% of DSP’s overall calculations for last year, so these schemes are particularly significant. For the duration of 2016, jobseeker’s benefit was €188 per week. Using the €172 million total, this indicates 914,894 weeks of fraud savings last year. Using the above table of multipliers, DSP assumes that each beneficiary of welfare fraud is equivalent to 26 weeks of payments lost. Dividing the total number of weeks by 26 therefore indicates 35,188 individuals were guilty of jobseekers’ fraud last year – which equates to 12% of the average number of people on Ireland’s live register (302,945) in 2016. In other words, the assumption is that one in ten people claiming jobseeker’s benefit are committing fraud. Which is a high figure by anyone’s standards. However, DSP’s own figures appear to contradict this. Splitting the difference here gives an indicative figure saved of just under €13 million, or about 7.6% of €172 million – less than a tenth of the actual savings being claimed. Throughout 2016 the OPFB stood at €188 per week, with an additional €29.80 per child covered. For the basis of this comparison, we’ll assume a single parent and two children -or payments of €247.60 weekly. The control number of weeks for termination of this benefit is 136 (more than 2.5 years). That suggests a saving to be made per incidence of fraud of €33,674. Using the €77 million total estimate, this indicates fraudulent claims at the full estimated rate in 2016. 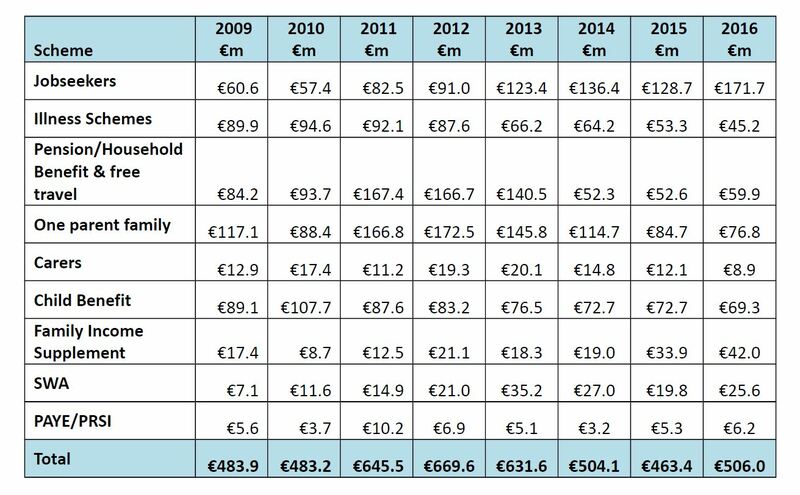 The most recent Social Welfare Services statistical report (for 2015, available here) indicates that €670.1 million was spent by the State on this benefit that year. This indicates an overall incidence of fraud rate of 11.5%, which is broadly in line with the assumed rate of fraud for jobseekers detailed above. Again, however, DSP’s figures appear to contradict this. Even taking into account the larger multiplier, which would appear to be very high, the estimated figure of €38 million saved is less than 50% of €77 million - less than half of the actual savings being claimed. From January 2016, the child benefit rate per month in Ireland was €140, or €1,680 per year. This indicates 41,071 instances of such fraud in 2016. According to the 2016 census, there were 1,190,502 children aged 18 or younger in the state. Assuming one payment per child, that indicates a fraud rate of 3.4% – or one in every 30 children’s benefits are fraudulent. Again, this seems quite a high estimate given the strict nature of the child registration process. Once more, DSP’s figures appear to contradict this. Again, even taking into account the larger multiplier, which assumes nearly three years worth of savings per instance of child benefit fraud, the estimated figure of €0.9 million saved is less than 1.3% of €69 million - just over one hundredth of the savings being claimed by DSP. Together the three benefits analysed account for 63% (€318 million) of the DSP’s announced savings of €506 million as a result of reported fraud in 2016. From our analysis, even following what appear to be especially high multipliers used to estimate savings, that figure is closer to €51.9 million – just 16% of the €318 million officially estimated by DSP. Note that this is an especially generous reading of these multipliers – others have estimated that the savings made were considerably lower. It should be noted also that even if the savings figures for the remaining welfare schemes were 100% accurate, the total could not come close to the €506 million being claimed. In fact, using our calculations as a proxy for the remainder, the overall savings figure would be in the region of €82 million. It also bears repeating that while DSP provided TheJournal.ie with the system of multipliers used when estimating fraud savings, the Department declined to provide its own methods for calculating those figures. Therefore, it has not been possible to check the logic behind those calculations. The purpose of this FactCheck is not to question why DSP’s savings estimates are as high as they are (and have been so consistently for at least the last eight years). However, in anecdotal conversation with statistical experts conducted in preparation for this article, it has been suggested that such outlandish figures were possibly of benefit to the Department when Ireland was involved with the Troika in the early years of this decade, and huge savings were expected to be achieved at all levels of government. Given that Ireland now appears to be relatively clear of recession, such substantial welfare fraud makes far less intuitive sense. In its correspondence with TheJournal.ie, DSP claimed that its system for estimating fraud is subject to “frequent reviews”, but also acknowledged that the last review of its welfare fraud estimating procedures was run in 2012 by the Comptroller and Auditor General (C&AG). It also acknowledged that this review five years ago “recommended changes”, which do not appear to have been applied as yet. “The Department is rolling out updated IT systems during 2017 to improve the data collection and analysis of its control activities,” its statement reads. Regardless, for this FactCheck, the conclusion regarding the Department’s claim is that it is false. Email “FactCheck: Did the government really save €500 million due to reported welfare fraud last year?”. Feedback on “FactCheck: Did the government really save €500 million due to reported welfare fraud last year?”.